Congratulations to CP Partners on the purchase of On Point (Osilvis—Carma, Cartouche Z). We are thrilled to have this very special 2016 colt, with Maplewood’s foundation bloodlines on both sides, remain a stallion prospect while he begins his competition career! Congratulations to Stacey Martin on the purchase of Nu Iago from Equine Traders in San Diego, California, with Kirsten Coe as the agent. We are so excited for this new partnership! Maplewood congratulates Lauren Raggio on the lease of Candy’s Gone from Maplewood! What a great match! We look forward to seeing you perform together in the Jumper ring! Maplewood congratulates Katherine Miller DeVre on the purchase of Dardam Q. We look forward to seeing your partnership develop in the Jumper ring! Congratulations to Chrysann Collatos on the lease of WKD Milano from Maplewood. We cannot wait to see how far you go with this wonderful Jumper! Maplewood congratulates Jessica Scott on the lease of Amarone from Salita Armour. 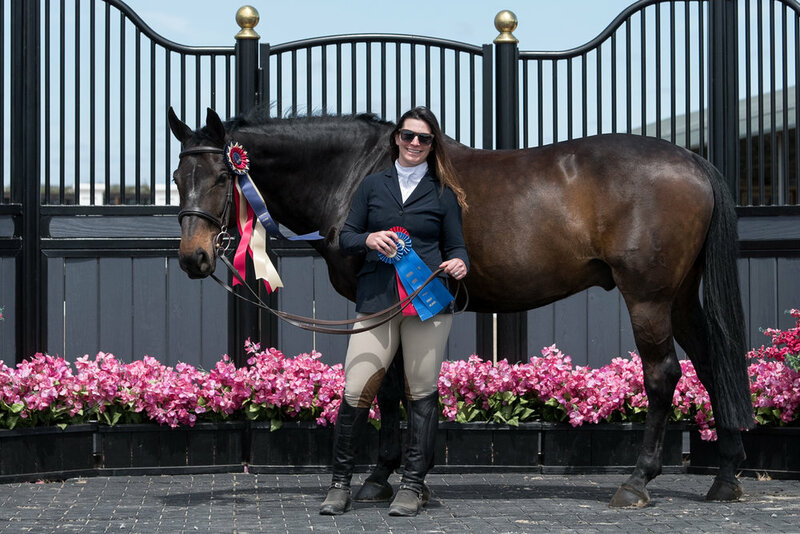 We wish you the best as you enjoy the 2019 show season with the lovely Hunter/Equitation horse! Maplewood congratulates Lisa Petersen-Trujillo on the purchase of Outspoken (by Osilvis). We wish you the best of luck with this very special mare! Maplewood congratulates owner Christina Kuhlmann and trainer Kim Laursen of Danville, California, on the purchase of Quintus. Maplewood, as agent, thanks Pine Trails Ranch for entrusting us to sell another wonderful horse for you. Best of luck with this talented young prospect! Congratulations to Amy Annis of Foxfield in California on the purchase of Amoretta from Pine Trails Ranch in Davis, California. Maplewood Stables was the agent. Best of luck with this wonderful mare! Congratulations to Tricia Booker and Carma on their partnership for 2017-19. Carma, a 10-year-old Rheinland Pfalz-Saar mare (Cartouche Z--Carentina, Caretino), was born and raised at Maplewood. "Stormy" had a foal in 2016 by Osilvis (see Sales page) and returned to the show ring in the fall of 2016. Tricia and Stormy will continue to train with Maplewood and compete in the Amateur Jumper sections. Congratulations to Karen Dearmont on the purchase of Outgoing, a 5-year-old warmblood mare by Osilvis. "Lightning" was born and raised at Maplewood. We wish you both the best! Congratulations to Mia Villoria on the lease of Dardam Q, owned by Patricia Napper. Maplewood was the agent and will continue to train the new team. Thank you Matt and Lindsay Archer for sending us this wonderful horse to sell! Special thanks to Julie Winkel, Kevin Winkel, Andrew Teer Jayne and Tricia Booker for the great rides! Congratulations to Lauren Elizabeth DiTallo, of High Finance Farm in Buffalo Grove, Illinois, on the purchase of the 2016 colt Captain, by Cartouche Z out of Telestar Nike. We are excited to see what the future holds for this handsome colt!